Originally from Ohio, Phil moved to Boulder after college and eventually Steamboat, purchasing Russell’s, along with partner Terry, in November of 1990. Read more about Phil here. Terry too is from the midwest – Griswold, Iowa. 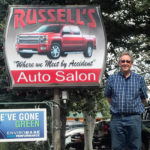 Terry loves cool cars and moved to Steamboat in 1984, purchasing Russell’s with partner Phil in 1980. Read more about Terry here. 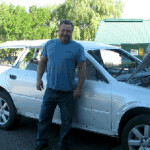 Jerry has over 41 years experience and has been with Russell’s since 2000. 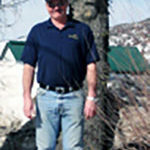 He enjoys camping and fishing and seeing his now-grown daughter and son. Brian has over 15 years’ experience and has been with Russell’s sine 1997. He enjoys camping, motorcycles, and 4-wheeling in his free time. Bobby has over 12 years’ experience and joined the Russell’s Team in 2005. He loves summer boating and camping with his wife and 4-year-old daughter. Tim with his 2001 325I BMW, which he recently repainted with graphics and rain drop effect. Tim enjoys doing graphics and the unusual.